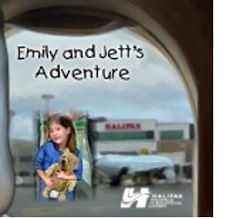 Emily and Jett’s Adventure tells the story of a young girl, Emily, and her teddy bear, Jett, who are travelling from Halifax to Ottawa. The book chronicles their parallel journeys – Emily in the airplane cabin, Jett in the baggage hold below the cabin. The book provides a glimpse into the airport security screening process each must go through, and then reunites them at their destination. The books are distributed free of charge by the Airport’s Tartan Team volunteers to families travelling with children in the 6-9 year old age range. When a book is provided to a child, we ask where Emily and Jett will be going. To view a map of their travels please visit the airport’s Facebook page here. Halifax International Airport Authority (HIAA) would like to thank the following people who were part of this special project. Cathy Towers, HIAA for her vision and leadership, as well as fellow HIAA committee colleagues: Peter Spurway, Sherrie Clow, Kelly Corbett, Ashley Gallant, Jennifer Delorey Lyon, Kim Porter and Kim Oakley. This project would not have been possible without you. Cathy Paget, HIAA for allowing the name and likeness of her daughter, Emily McNamara, to be used as inspiration for the storybook’s heroine. Emily McNamara passed away in March 2011. Mindy Lee George, writer; Donell Hagan, illustrator, and Diane Tibert, editor.